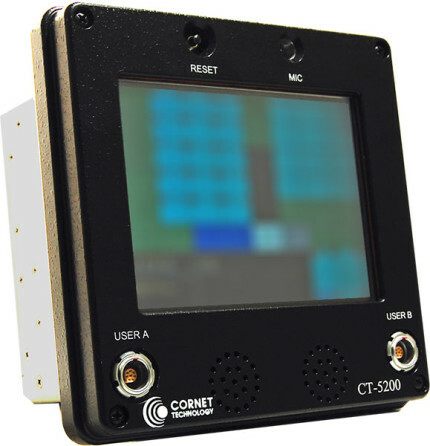 The CT-5200 is an integrated voice terminal that gives access to both internal and external shipboard communications equipment such as telephones, tactical intercoms, radio communications, public announcements, and casualty reporting systems. This easy to use terminal is feature rich offering a touch sensitive screen display, left and right ear and speaker volume control, remote side tone, and more. The CT-5200 is controlled by the Department of State, International Traffic in Arms Regulations (ITAR), 22 CFR Parts 120–130, and cannot be exported from the United States or demonstrated to a foreign person without prior approval from the U.S. Department of State. Contact us for additional information on this offering. 5.5" H x 5.5"D x 5.5" W; ~ 8lbs. 8” H x 8” D x 8” W; ~6.5 lbs.